STEM careers (science, technology, engineering, and mathematics) were once dominated by men. Girls were not encouraged to pursue those disciplines, and women working in STEM careers were an exception to the norm. A perfect example is the story of the human computer Katherine Johnson featured in the movie “Hidden Figures”. Johnson is best known for being “the girl” that astronaut John Glenn wanted manually verifying the computer calculations necessary for the Friendship 7 mission. The movie represented how in the 1950s and 1960s, women like Johnson had to work harder and longer to overcome the prejudices of the time to gain the respect of her associates. Through the breakthroughs of Johnson and other women like her, the tables are turning and STEM-based industries are more welcoming to women. When it’s time to make challenging decisions or garner opinions that can impact our most valuable asset, our PEOPLE, Issuetrak sends out a Thoughtexchange. Life at Issuetrak is much more than a job; it's an opportunity to give back to our community. Everyone loves a good celebration and here at Issuetrak we have a great reason to celebrate. This December, we’re turning 25! Issuetrak is excited to announce our new strategic partnership with Amazon Web Services (AWS). The new AWS infrastructure will allow Issuetrak to provide our customers with improved levels of security, availability, and performance. It will also enable us to continuously deploy new features to our customers. We will be moving our cloud operations from Rackspace to AWS beginning next month. We are thrilled to announce that Issuetrak was included in the Masters portion of the FrontRunners Quadrant for Help Desk Software for January 2017! 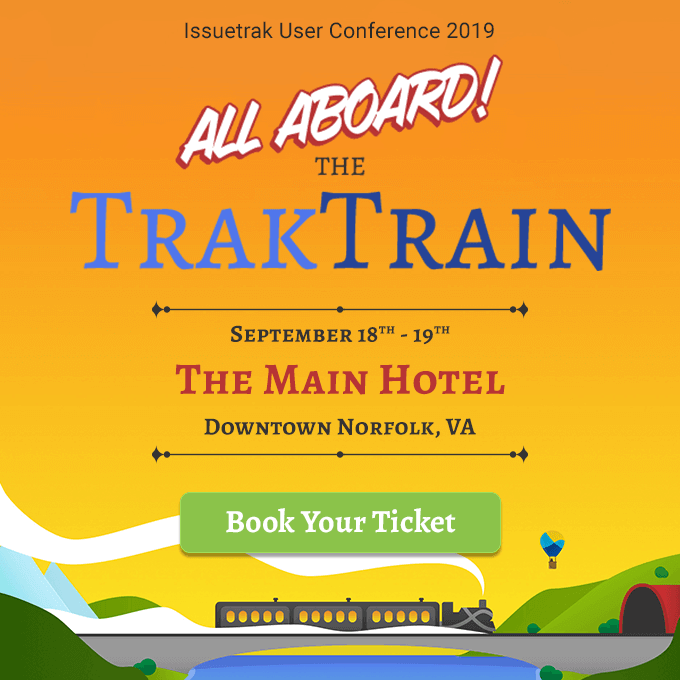 For the past several months, Issuetrak has had the pleasure of sponsoring and hosting monthly Docker meetings for the development community of Hampton Roads. Docker is a relatively new way of packaging applications so that the application runs as expected, no matter the environment. These application “containers” include everything the software needs to run, making them lightweight, secure, and easy to deploy. Since launching in 2013, Docker has been steadily building its profile and list of partners, quickly becoming a major player in the software development industry. While Docker isn’t something that is an active part of our own application, it is a platform we’ve been following closely and learning more about. [August 2018 Update] This scholarship is no longer being offered. We would like to thank all previous applicants and wish everyone the best of luck in all future endeavors. Should anything change in the future, we will be sure to publish an update! Issuetrak is proud to announce the Spring Semester 2017 #HeadInTheClouds Issuetrak Scholarship! We’ll be awarding two $1000 scholarships to university undergraduates working toward a degree in computer science, computer engineering, or other related field.